Sir William Watson Cheyne, 1st Baronet, KCMG, CB, FRCS, lived from 14 December 1852 to 19 April 1932. He was a surgeon and bacteriologist who helped pioneer the use of antiseptics in surgery. The wider picture in Scotland at the time is set out in our Historical Timeline. William Cheyne was born on board a ship off Tasmania. His father was a ship's captain from Shetland. His mother Eliza died when William was four, and he was then brought up first by Eliza's father, the Rev William Watson, and then by her sister and brother-in-law. Much of his childhood was spent on the island of Fetlar, in the Shetland Islands. From 1864 he attended Aberdeen Grammar School, and he then became a student at King's College, Aberdeen, studying Greek, Latin, English and Mathematics. In May 1871 he began studying medicine at the University of Edinburgh. After Cheyne graduated in 1875 he became an assistant surgeon to Joseph Lister, the first surgeon in Britain to take an interest in antiseptic surgery. At the time Britain lagged behind developments in countries such as Germany and France. Both Lister and Cheyne took up posts at King's College Hospital in London in 1877, with Cheyne serving as an assistant surgeon and surgeon before being appointed Professor of Surgery from 1891 to 1917. He was greatly influenced by the work of the German bacteriologist Robert Koch, and visited him in Berlin in 1886. In 1882, Cheyne published his highly influential book Antiseptic Surgery: Its Principles, Practice, History and Results. He followed this with Lister and His Achievements in 1885. Cheyne acted as a consultant surgeon for the British army in South Africa in 1900 and 1901; was made a baronet in 1907; and in 1910 was appointed Honorary Surgeon-in-Ordinary to King George V. During the First World War he joined the Royal Navy and was made Surgeon Rear-Admiral. In 1917 Sir William Cheyne was elected to be the Unionist Member of Parliament for the seat of Edinburgh and St Andrews Universities. The following year he became MP for the Combined Scottish Universities. 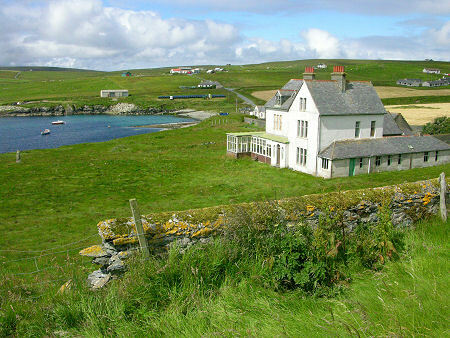 He retired as an MP at the 1922 general election, and settled back on Fetlar, living at Leagarth House. From 1919 to 1930 he served as Lord Lieutenant of Orkney and Shetland. Sir William Cheyne died on Fetlar in 1932. His life and achievements are celebrated in a display in the Fetlar Interpretive Centre.